Doris Arlene Hall died Friday, March 8, 2019 at the Good Samaritan Society in Corsica. Funeral services are 10:30 AM, Saturday, March 16, 2019 at the Grace Reformed Church in Corsica. Burial is in Graceland Cemetery in Mitchell. Visitation will be at the church on Friday with the family present from 5 to 7 PM. Crosby-Jaeger Funeral Home in Wagner is in charge of arrangements. 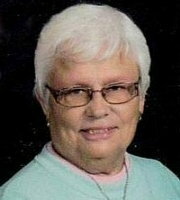 Doris Arlene Hall was born in Delmont, SD on March 6, 1934, the daughter of Lonnie and Vivian (Gustine Caldwell) Uecker. She died Friday, March 8, 2019 at the Good Samaritan Society in Corsica at the age of 85 years and two days. Doris graduated from Ravinia High School in 1952. She married Neil Hall on July 7, 1953 at the East Lake Andes Lutheran Church. Doris worked in the office for Park-Grant Wholesale Foods in Huron from 1954 to 1958 and worked full time to help put Neil through college. She learned Bookkeeping under Ken Pistulka at the Fairfax Farmers Co-op in Fairfax and worked there from 1958 to 1964. She continued to work as a bookkeeper at Fullerton Lumber Co. in Corsica from 1973 to 1978, Van Marel Lumber in Corsica from 1979 to 1986 and for Dave Meyerink at Corsica Lumber from 1986 until she retired in May of 1999. Doris will be remembered for her love for her family, being a very caring, hard working and devoted wife, mother and grandmother who was always willing to help others and had a very friendly, generous and kind personality. She loved spending time with her family and did so as often as she could. Doris loved to work in the yard with plants and took pride in keeping everything picked up, neat and clean. She was a perfectionist. Doris had a special place in her heart for her dog Brownie as a young child and in her married life her family dog, Tippy. She enjoyed old classic country western music and popular music of the 60’s, 70’s and 80’s. She loved going to polka dances, polka festivals and doing the Polish-Polka Hop dance. Doris also enjoyed bowling and sewing. Thankful for having shared her life are her husband Neil Hall of Corsica, son Terry (Jody) Hall of Rapid City, daughter Kimberly (Dallas) Drietz of Lake Benton, MN; six grandchildren: Jon, Eric, Matthew and Hannah Hall, Marquette Nelsen and Josiah Drietz; 12 great grandchildren; brother Dewey (Rita) Uecker of Manteca, CA; sister Joyce Houze of Manteca, CA; and sister-in-law Marjean Uecker of Manteca, CA. Doris was preceded in death by her parents and brother Vernon Uecker.